Communication is key for financial advisors in keeping clients happy. What does the average investor have in common with a wealthy investor? At least in the latter case, many believe that their advisor is not doing enough: About 45% of millionaires would not recommend their financial adviser to friends or family members, according to a Fidelity Investments‘ survey of 1,287 affluent investors. But you don’t have to be a rich client to be unsatisfied with your financial advisor. 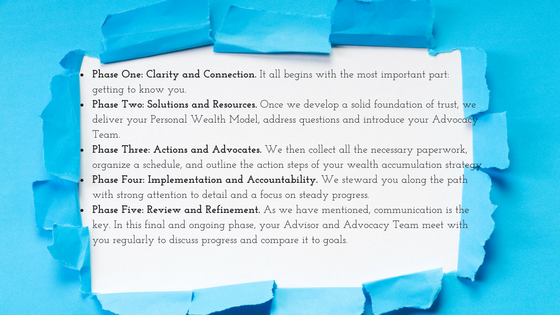 It’s on the advisor to solicit ongoing feedback with their clients to ensure they are happy. If an advisor doesn’t communicate with their clients on a regular basis, then how do they expect to keep those same clients happy? This is our belief at Mooney Lyons. Our entire practice is founded around the philosophy that relationships built on trust and integrity with ongoing dialogue are most likely to produce the desired results. The more we get to know our clients, the better we are able to understand what they are looking for. Building these professional, yet personal relationships allow us to help our clients put the pieces together in the right order. It is important to have open lines of communication with your advisor so they can address your needs early on. At Money Lyons, we make sure you understand your long-term plans and are always available to talk to you about any questions or concern you might have about your financial future. Mooney Lyons is here to help. Visit us at mooneylyons.com or call us at 1.847.382.2600. Skinner, Liz. 4, August. Financial advisers not as popular with millionaires as you’d think. Investment News.